Just before I departed Little Rock for Berkeley, CA in August 1980, I ran across a phonograph record in the Little Rock public library that caught my eye. It included some strange compositions by a man who had been born and raised in Texarkana, but had been living in Mexico City for several decades. Uniquely, the liner notes stated, his compositions were for a player piano. I checked out the record and, even though my roommates disparaged my interest in the sometimes frantic music, I found the compositions intriguing. When I showed up in Berkeley, I learned that a local record company had released more "studies" by this composer, Conlon Nancarrow. I got those records and started doing some research on his life. His story was a rich one. After growing up in Texarkana, he had moved east in 1931 to study music during the Depression and had become in communist. In 1937, he joined the Lincoln Battalion to fight against Franco (and his fascist allies) in the Spanish Civil War. Feeling mistreated by the government when he returned, Nancarrow moved to Mexico City in 1940 and decided to become a Mexican citizen. Distant from the world of music he had known in Boston and New York, he decided to explore his interests in rhythm by composing for the player piano, punching his compositions directly on player-piano rolls. His "studies" were prepared for two player pianos, which he had modified, in his Mexico City home. They could be heard only by going to Nancarrow's home. He continued his composing, without recognition, for nearly 30 years before Columbia Records traveled to his Mexico City studio and in 1969 recorded some of his studies. This record stirred interest in his work and, over time, others came to his studio and recorded his music. By 1980, when I first heard of Nancarrow, his fame had been slowly spreading and his decades of work had begun to pay off. In June 1981, he traveled to San Francisco to attend the New Music Festival at which his music was featured. (The trip was his first to the United States since 1947.) I attended the festival and a lecture he held. Also, I met him briefly through his brother, who was on the Texarkana city council for whom I had done some consulting work a couple of years earlier. In 1982, I went to Aptos CA to attend the Cabrillo Festival, where he and his music were again featured. By then, his fame had multiplied and he had won prestigious Guggenheim and MacArthur fellowships. After that festival, I moved on to other interests and after that did not pay much attention to Nancarrow and his life. He did just fine without my attention. Below is a transcription of an article I wrote about Nancarrow in 1982. It was published in the Grapevine, a Fayetteville weekly. (Unfortunately, the paper got my first name wrong in the byline.) Reading this article more than three decades later, I still find Nancarrow to be a rather romantic figure: a man who set his own course in music without much expectation of recognition. Nevertheless, in spite of the odds against him, his talent won out and he received accolades for his accomplishments. In essence he shaped the world around him rather than letting it shape him. Conlon Nancarrow, an Arkansas-born composer now living in Mexico, has spent the past thirty-five years writing piano compositions that no person can possibly play. Since the middle 1940s, Nancarrow, trained in classical music and experienced as a jazz trumpeter, has composed music exclusively for old-style player pianos. More accurately, he has punched his compositions directly onto player piano rolls that can be played only on two specially modified player pianos that he keeps in his Mexico City home. Writing music to be played only on your own player piano is not the conventional path to success for a composer. But then Conlon Nancarrow’s music, like is life, reflects an uncompromising individualism. His devotion to the player piano comes from his intense fascination with the use of rhythm and time in music. By punching his music onto the player piano roll, Nancarrow can produce complex rhythmic patterns and intricate, multi-layered tempos which no pianist—or even two or three at the same time – could ever play. Nancarrow, now approaching seventy years of age, is emerging from long years of obscurity. His music, work of awesome originality, has caught the imagination of the avant-garde music world. His compositions (presented on tape) were featured last June in San Francisco at the New Music America ’81 Festival which was broadcast throughout the nation by National Public Radio. Nancarrow made his first trip to the United States since 1947 to be honored at the festival. Altogether, Nancarrow has written 43 player piano compositions, which he calls “studies.” Each is from one to ten minutes long. It takes Nancarrow six to eight months to punch a six-minute composition on a piano roll. Thus, over three decades of work are contained in approximately four hours of music in these 43 rolls. In this compact package of music, the work of a lifetime, torrents of piano notes are woven into powerful patterns through the imaginative manipulation of rhythm, tempo, and dynamics. The music is more akin to that produced by electronic instruments than the classical piano, but it has a deep intertwining of emotion and intellect usually lacking in electronic music. However Nancarrow’s music is described, no one will accuse him of being boring. For one thing, he is the only composer ever to compose by munching his music onto piano rolls. Nevertheless, Nancarrow’s music does reflect the influence of others. 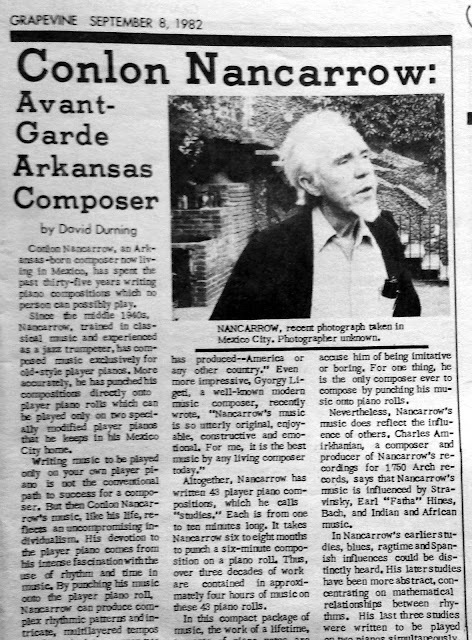 Charles Amirkhanian, a composer and producer of Nancarrow’s recordings for 1750 Arch records, says that Nancarrow’s music is influenced by Stravinsky, Earl “Fatha” Hines, Bach, and Indian and African music. In Nancarrow’ earlier studies, blues, ragtime and Spanish influences could be distinctly hears. His later studies have been more abstract, concentrating on mathematical relationships between rhythms. His last three studies were written to be played on two pianos simultaneously, creating an even more complex and startling barrage of tempos and rhythms. The singular character of Nancarrow’s music is reflected in his life. Things started ordinarily enough: he was born in Texarkana, Arkansas in 1912, and spent his boyhood there. His father was manager of the Gulf Cooperage Company and served as mayor in the late 1920s and early 1930s. Charles Nancarrow, Conlon’s younger brother, still lives in Texarkana, where he has long worked in wholesale trade and has been active in civil affairs. Both Charles and Conlon played in the local Fred Martin’s Boy Band and American Legion band. Charles played the clarinet while Conlon played the trumpet. After his father’s death in 1931, Nancarrow left Texarkana to begin the serious study of music, something his father had opposed. He studied first at the Cininnati College Conservatory for two years. He then took private music instruction, while employed by the Boston WPA, from Walter Piston, Nicolas Slonimsky, and Roger Sessions. Like many other idealists at the time, Nancarrow made a decision in 1937 that was to dramatically affect his life: he joined the Lincoln Battalion, part of the International Brigade, to fight against Franco in the Spanish Civil War. Nancarrow was wounded while fighting in Spain and returned in 1938 to Texarkana to convalesce. After his return, he was harassed by the U.S. government, which viewed members of the Lincoln Battalion with suspicion beause of its ties to the Soviet Union. Nancarrow moved to Mexico City, where a progressive regime held power, in 1940. His uneasy relations with the U.S. government convinced him that he would get no protection from it in times of emergencies, and he decided to become a Mexican citizen. He obtained Mexico citizenship in 1956. After setting in Mexico City, Nancarrow continued composing while taking on part-time jobs to earn a living. By the middle 1940s, he fixed upon the player piano as a medium for his work. In 1947, he journeyed to New York to buy a machine designed to punch player piano rolls. Since Mexico City is far from the musical mainstream, Nancarrow has worked with little direct contract with the musical world. He accumulated vast amounts of written and recorded materials that allowed him to pursue his study of rhythm and tempo, but went his own may, writing music to please himself. Until recently, the only way to hear Nancarrow’s music was to journey to his home in Mexico City where he keeps his two upright pianos with Ampico reproducing mechanism. These pianos have been modified to give them a more metallic sound. Since Nancarrow will not move his pianos for concerts, his music could be played only at his house. Nancarrow’s music was first brought out of his house in 1969 when Columbia Records went to Mexico City, recorded several of his compositions, and released them in an album, Studies for the Player Piano. After twenty years of composing, Nancarrow’s music was brought to the music public. In the early 1970s, a group of young, avant-garde composers journeyed to Mexico to hear more of Nancarrow’s music. They were excited by what they heard, and began a campaign to secure a larger audience for his music. As a result, all of Nancarrow’s music, recorded in Mexico City, is being released by 1750 Arch Records in Berkeley, California. To date, three volumes have been issued and two more are planned. The last few years have brought honors and success to Nancarrow. He was awarded a Guggenheim Fellowship in 1978, and this year  he received a MacArthur Foundation grant (up to $300,000) which is awarded to creative people who do not apply for the grant nor have to do anything specific with the money. The European Broadcast Union commissioned him to write several composition. His journey to San Francisco for the New Music Festival brought him acclaim and gained national exposure for his music. Nancarrow will return to the United States in late August  to be the featured composer at the Cabrillo Festival in Aptos, California. His music will be presented in a New York City concern on October 27. Shortly after the New York concert, Nancarrow will embark on upon a tour of Europe that will be highlighted by his appearance as a featured at the Autumn Festival in Graz, Austria. This growing interest in and acclaim for Nancarrow’s music is a triumph not only for his musical talent, but also for the extraordinary artistic integrity that kept him wedded to his player piano toiling in obscurity and isolation. He joins a growing list of both classical and popular musicians, vocalists, and composer from Arkansas, a state rich in musical tradition.